i. NITI Aayog unveiled its comprehensive national Strategy for New India titled ‘Strategy for New India @75’, which defines clear objectives for 2022-23. 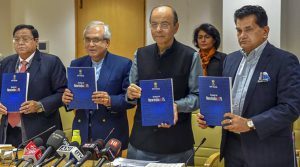 The document was released by the Finance Minister of India Mr Arun Jaitley. ii. The Strategy Document advocates empowering and encouraging women to participate across all sectors of the economy, to build a strong and inclusive New India. NITI- National Institution for Transforming India. NITI Aayog Vice-Chairman- Rajiv Kumar, CEO- Amitabh Kant. i. Assam government has announced three schemes for the welfare of farmers. The schemes are the Assam Farmers’ Credit Subsidy Scheme (AFCSS), Assam Farmers’ Interest Relief Scheme (AFIRS) and Assam Farmers’ Incentive Scheme (AFIS). ii. 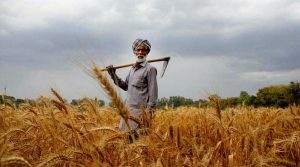 Under AFCSS, whatever amount of loan the farmers took from banks and whatever amount they repaid, 25% of the money will be reimbursed by the state government. i. Lok Sabha has passed the Surrogacy (Regulation) Bill, 2016 which is aimed at prohibiting commercial surrogacy and unethical practices relating to it. The Bill has provisions to constitute National Surrogacy Board, State Surrogacy Boards, and appointment of appropriate authorities for regulation of surrogacy. i. 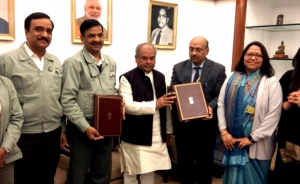 Ministry of Rural Development (MoRD) signed MoU with Maruti Suzuki India Ltd for training rural youth for skill development in presence of Minister of Rural Development Narendra Singh Tomar. ii. Deen Dayal Upadhyaya Grameen Kaushalya Yojana (DDU-GKY) is the flagship placement linked skill-training programme under the MoRD. i. India’s largest cancer institute, the National Cancer Institute (NCI) has been soft launched at Haryana’s Jhajjar area. The institute was finalised at a cost of Rs 2,035 crore and the project was approved by the cabinet committee in 2013.
ii. The aim isto strengthen research and also bring down the patient load at All India Institute of Medical Sciences’ (AIIMS) cancer centre. The hospital will be fully functional by December 2020.
i. 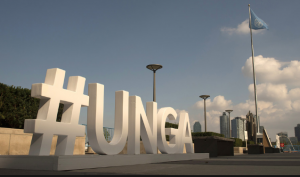 The U.N. General Assembly voted nearly unanimously to adopt a framework to strengthen the international response to the global refugee crisis. i. The government had notified a High-Level committee for implementation of Clause 6 of Assam Accord. Retired IAS officer M.P. Bezbaruah is chairman of the 9-member Committee. The committee will examine the effectiveness of actions since 1985 to implement Clause 6 of the Assam Accord. ii. The clause envisaged that appropriate constitutional, legislative and administrative safeguards, should be provided to protect, preserve and promote the cultural, social, linguistic identity and heritage of the people of Assam. Assam Capital: Dispur, CM: Sarbanand Sonowal, Governor: Jagdish Mukhi. i. Home Minister Rajnath Singh presented Ramnath Goenka Excellence in Journalism awards in 18 categories across print, broadcast, and purely-digital for outstanding work done in 2017.
ii. 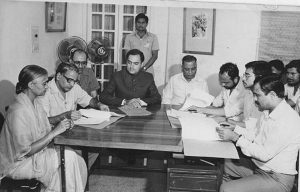 The Express Group instituted the Ramnath Goenka Excellence in Journalism Awards in 2005 as part of the centenary year celebrations of its founder, Ramnath Goenka. i. The 76th Annual Golden Globe Awards were announced at the Beverly Hilton Hotel in California, the USA. These annual awards honour the best in Motion Pictures and Television for the year 2018.
ii. 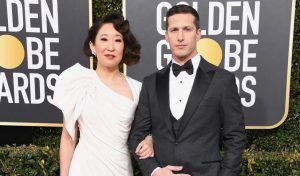 This year’s event was hosted by actors Andy Samberg and Sandra Oh, who took over from 2018 host, comedian Seth Meyers. i. 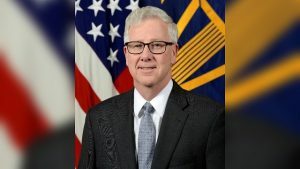 In the United States, Department of Defence, Chief of Staff, Rear Admiral Kevin Sweeneyhas resigned, a month after Defence Secretary James Mattis announced his departure. ii. He is now the third senior Pentagon official to announce his resignation since President Donald Trump announced US forces would leave Syria. i. Switzerland’s Roger Federer and Belinda Bencic secured victory over Germany’s Angelique Kerber and Alexander Zverev to win the Hopman Cup for the second year in a row. Twenty-time Grand Slam champion Federer is the first player to win three Hopman Cups – twice with Bencic and once with Martina Hingis, in 2001.
i. 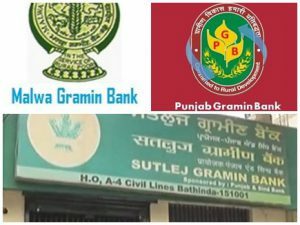 The government has amalgamated three Regional Rural Banks– Punjab Gramin Bank, Malwa Gramin Bank and Sutlej Gramin Bank – into a single RRB. ii. The sponsor banks of the RRBs are National Bank for Agriculture and Rural Development (NABARD), the Government of Punjab and Punjab National Bank, State Bank of India and Punjab and Sind Bank. Father Of RRB is M.Swaminathan.